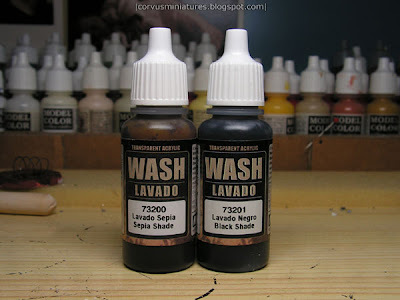 Vallejo recently released two new products: washes and pigments. The washes are obviously to compete with Games Workshop's latest line of washes. 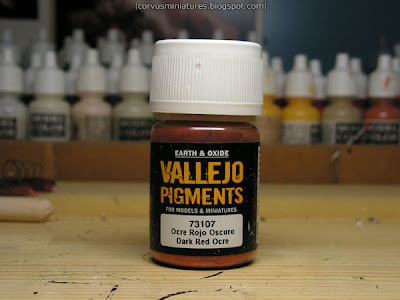 But where GW has a complete range of colors, Vallejo only has 2 so far: black and a sepia tone. There is a rumour that a third color will be added: a beige-brown. Their other new product is a complete line of pigments, similar to MiG pigments, which is very popular among military modellers. But the Vallejo variant is cheaper and holds a third more powder than the MiG jars. I decided to pick up a red-brown tone to test it out on a base. I'm currently working on a Space Marine Terminator and decided to use these new products on it. I will post a WIP picture very soon. I think these new miniatures are of very high quality. And they're very cheap when compared to Games Workshop's plastics They're multi part with several options such as the weapon and the pose of the arms. Anyway I hope you like the paintjob! After a 5 month hiatus this feature is back. I'm going to try to catch up with all the great entries I've missed since my last my last CMON Favorites post. Actually I haven't been on CMON ever since, so I'll have to do a lot of catching up. To make things easier I only browsed images with scores between 9 and 10. Leonardo DiMiragliano - The Great Wyrdstone Collector... Part I of IV by Matt Cexwish - a diorama like you've never seen before. I wonder if there really will be 3 other parts. Anima Tactics Kujaku Hime by Bren - Brenda Gosman's winning entry from last year's Crisis, as seen in my picture report. Sentinel by automaton - very nice weathering effects, along the lines of Ben Komets. Urban Warfare by jarhead - an Infinity miniature and some basic scenery is used to create a very apocalyptic atmosphere. Krieg HQ Squad by Kaple - at first I thought the color scheme was a bit odd (because I expected the Krieg to be grayish) but the painting and the subtle weathering on them is actually really well done. Limited Edition Sorceress by mrika - a nice color transition on the robe and super-fine details make this figure a winner. Psycho! by Bren - Another entry by Brenda.